I was late. Five days late, to be exact (and for me, THAT WAS LATE!). I will never forget that surreal moment on October 1, 2013, as two pink lines appeared in the tiny window of my pregnancy test. I stared at it for an entire minute before running into the bedroom to shake my husband awake. He didn’t comprehend my words until I held up the positive test…then he grinned the biggest grin possible, nodded his head in pride (as only a 9th warder can), and embraced me. Although it was 6AM, I immediately Skyped my mother and told her the news! She and my dad were overjoyed- and yet, as excited as I was, I also felt like I had been punched in the stomach. I had only been in this town for less than two months, I was over 1100 miles away from my hometown (read: my mama), and NOW I’m pregnant?? Ironically, that day was moving day to a more permanent apartment but we had only chosen a one bedroom because it would only be the two of us…HA! Rain on your wedding day. We would move out of that apartment just two months later to a rental house. Living in a place in which you’re not only the minority, but also where you offend people with your very presence was culturally shocking and extremely unnerving. Rewind to two months before, the beginning of August, to when I found out I had landed a position in this tiny town of Farmington, NM. I was to start working immediately, so hubby and I packed up our lives essentially (he transferred to this location with his retail job) and headed to the southwest. Living in a place in which you’re not only the minority, but also where you offend people with your very presence was culturally shocking and extremely unnerving. I wondered if I had made a mistake (at times I still do), and I said to myself that the point of the move was to gain experience so I could move on in my career. Three years, tops. Well, a baby really does change everything! I thought my baby boy had just delayed my plans– I had no idea how much he would change my life. Now, fast forward 9 months after October 1, 2013- to June 6, 2014. My baby boy was born at 4:55 AM, perfectly healthy, and nursing like a champ. The fear and pain I had just experienced were still very real to me in that moment. I was exhausted and slightly delirious. Yet, his tiny, warm body wrapped up into my chest was all I paid attention to for two solid hours after the nurse handed him to me. I tried to wrap my brain around the fact that this was who had been kicking me and leaning on my bladder for the last few months. This person, was my baby- MY BABY. Not just some cute little human I could kiss, cuddle, and give back to the owner. He was mine, and I was his. His roadmap, his life-force, his refuge. He was the new meaning in my life, who would help form a newer version of myself. This person, was my baby – MY BABY. Our relocation to Farmington involved much more than job opportunities; it marked the beginning of motherhood, a journey that has helped to produce a hybrid version of myself and becoming a mommy. I continue to learn about this new me on a daily basis…the identity struggle of motherhood is painful and daunting. Being a mother isn’t always pretty, and almost never perfect. Surviving those dark places has given me perspective on myself, my faults, and my strengths. Motherhood has stretched and deepened me in many ways. I may not always make the best decisions, but I truly desire the absolute best for my son, and want him to be infinitely happy and fulfilled for the rest of his life. So today, on the 4thanniversary of my first tiny blessing, I celebrate the wonderful impact his birth has had on my (our) life. My “sonshine” is smart, passionate, active, loving, caring, handsome, stubborn, observant, nutty, and generous. Thank you for making me a mom. Thank you for giving me kisses unabashedly; For singing me happy birthday (no matter what day it is) daily after “cooking” and “baking” for me; For being the best big brother to your baby sis; and for simply being the only you in the world that will ever see. I am so proud to be your mommy. I was late; but you were right on time. Sheryl James is a fun loving wife and momma who enjoys shopping, reading, and chocolate. 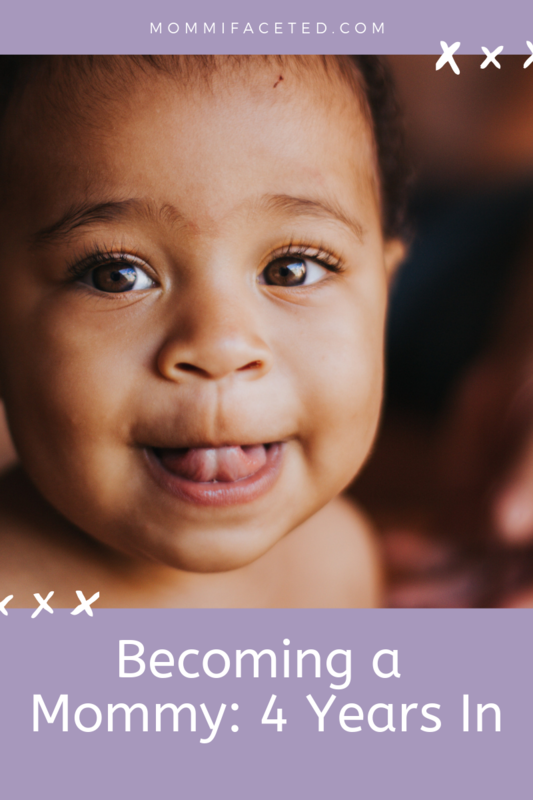 Raising her 4 and 2 year old inspired her to write about the ups and downs of her motherhood journey, and to connect with other mothers to share our experiences. She believes that a happy mom equals happy kids, so she is determined to embrace motherhood AND her full self all at once. Grace over guilt, mommas! She blogs at fourlittlefeet.blog.